After having a profound healing experience as a teenager through Qigong, meditation, and Kung Fu, Master Instructor Jason Campbell made the decision to commit his life to the study of self-cultivation through the eastern health and spiritual arts. 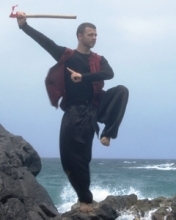 Master Instructor Jason Campbell is currently a 6th Degree Black Belt registered with the United Martial Arts Association of America and recognized by the National Qigong Association, Yoga Alliance and The International Doh Yi Federation. He has trained with many Masters and Grandmasters of many different disciplines, has been teaching full time for over 20 years, and currently owns and licenses Kung Fu, Zen Yoga and Zen Wellness Centers. Master Campbell has also worked with and consulted with hundreds of studios and over 200 clients in the US, Canada, Europe and Australia, teaching entrepreneurial skills to the owners and independent teachers. He is the author of numerous books, manuals, CD’s and DVDs teaching Zen Yoga, Kung Fu, Qigong and entrepreneurial skills, including the highly acclaimed “Official Yoga Business Success Guide” and “Creating Abundance in Your Spiritual Business”. Master Instructor Jason Campbell continues his training and teaching in the Phoenix area and conducts international Qigong Instructor training and Zen Business bootcamps for spiritual entrepreneurs. He balances his teaching and businesses with his own personal cultivation and time spent with his children, Jake and Mary.